Easily secured to any wall, you simply need one screw or nail to hang it on. The old look is purposely done to give a country style feel. Sisal type rope handles have been fixed on to give an outstanding look, along with an internal. Bathroom Cabinets Floor Storage Organizer. TV Wall Mount Bracket Dual Arm Tilt Swivel. Suspension & Steering. Wheel Spacers. 5 tiers wall mount zigzag corner shelves. Vehicle Air Tools. Vehicle Hand Tools. Rustic Shelves | Chunky Solid Wood Shelf With Industrial Wall Brackets |22cmx5cm. Condition is New. Industrial Pipe Shelf With Hooks. Industrial style shelf with hooks. Ready to hang with 3 hooks. Industrial style. Industrial style storage units. Wall clocks. Kitchen storage jars & accessories. We aim to resolve any problem as quickly as possible. The hooks could hold mugs, tea towels and hand towels, coats, jackets, scarves, or anything else you fancy. This industrial shelf unit has a lovely rustic finish and would suit any room in your house. Circular Industrial Style Wall Hanging Shelf Display Unit. The shelf's shape is very unique as it has. The black and wooden finish makes this item match. Has two drawers for storage. Also great for the kitchen to hold spices and jars. Cream Wall Mounted Plate Rack - Lyon Range. We've been around since 2004, starting off as a one-woman, one spare bedroom band, we now have a super-duper glamorous warehouse and showroom near Doncaster. Handmade Rustic Scaffold Board Shelf. Shabby Chic Wooden Spice Rack. Spice Jars/mugs not included. Includes Brass Wall fixings. Hand Decorated, Lightly Distressed, Waxed. Available in various colours. Soft grey. Light blue. 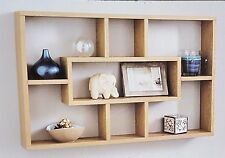 Amazon 70cm sectioned wall shelf in light oak and white high gloss. Handy 70cm wide wall shelf with sectioned areas for latest DVDs. Easy self assembly. Wooden Industrial Wall Cabinet Multi Drawers. Has 5 storage drawers to keep smaller belongings. Lovely rustic wooden finish that will look. adds to the quirkiness of this item. Contemporary Gold Style Round Wall Unit. Ideal addition for the hallway to keep keys on the 5 hooks. Gold finish to add a luxurious feel. Lovely as a gift for a house warming present. SKU: MS7033. Capacity up to 213 DVDs or 324 CDs or a combination of both. (You would need to allow spare of 30cms either side for opening.). COLOUR/FINISH: Oak. Easy Self Assembly. Rustic wooden floating shelf " Tea light /candle holder L@@K .
This one has a heavy sanded antique " BRIWAX " finish. Easy to fix just drill through timber at any point in unit and fix using plugs and 80 mm screws. The full height when the shelf is hanging (including the rope) is 108cm. Create a stunning wall display with this round organic steel shelf.